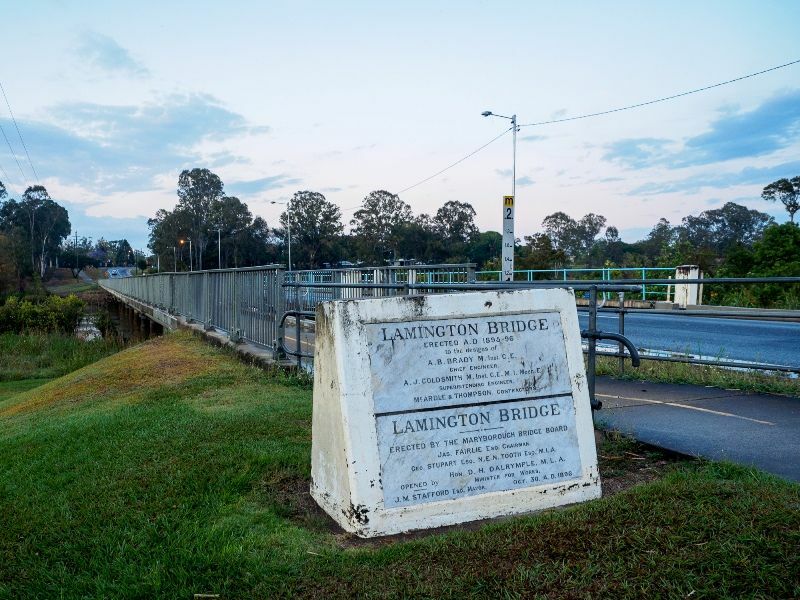 An Historic Engineering Plaque commemorates the Lamington Bridge. The abnormal floods of February 1893 caused the partial destruction of the highlevel timber bridge across the Mary River, Maryborough thus cutting off the means of communication between Maryborough and Tinana and the important goldfield of Gympie. The Queensland Government and the Maryborough Bridge Board then decided to replace this bridge, erected in 1874, with a low-level bridge. The new bridge, a concrete structure, was opened to traffic in October 1896 and is still in service. The bridge was formally opened for traffic with some ceremony on the 30th October, 1896, by the Hon. 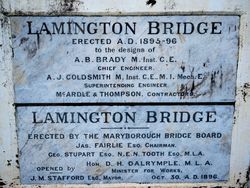 David Hay Dalrymple, M.L.A., Minister for Public Works, in the presence of a large and representative assembly of the public, and the structure was named the Lamington bridge, in honour of His Excellency the Right Hon. Baron Lamington, K.C.M.G., Governor of Queensland. OPENED TO TRAFFIC ON 30 OCTOBER 1896, THIS IS AUSTRALIA'S FIRST LARGE REINFORCED CONCRETE ROAD BRIDGE. DESIGNED BY A. B. BRADY, AND NAMED AFTER THE GOVERNOR OF QUEENSLAND, IT HAS ELEVEN 15.2M SPANS AND A TOTAL LENGTH OF 187M, LARGER THAN ANY KNOWN COMPARABLE BRIDGE IN THE WORLD AT THAT TIME. BRADY WAS HONOURED BY THE INSTITUTION OF CIVIL ENGINEERS, LONDON FOR ITS DESIGN. THE BRIDGE WAS WIDENED IN 1970. THE DEPARTMENT OF MAIN ROADS, QUEENSLAND, 1996.